Using the United States' "We Want You" draft poster might be overstating it, but there is no denying that, despite the ongoing economic depression which has caused a historical low in job placements for Japanese graduates in the last few years, study abroad students are very demanded in Japanese companies. Taken as a whole, the employment rate for newly graduates is decreasing. Nevertheless, if you consider it from the international students' standpoint alone, after hitting rock bottom in 2010 the situation has rapidly stabilized before rising anew, leading up to 8,500 new jobs in 2011. This tendency seems to be here to stay: with Japan aiming at improving its position on the international market, Japanese companies appear keener on recruiting study abroad students rather than Japanese graduates. Study abroad students from all over the world! So far, Chinese, South Koreans and Taiwanese have made up for the majority of the international workforce in Japanese companies. But the trend has been changing recently, with a rise in workers coming from other countries, mainly Vietnam (+45% from 2010 to 2011) and Bangladesh (+29% from 2010 to 2011). Accordingly with Japanese companies' development on foreign markets, these companies now hold a keen interest in study abroad students originating from countries they hadn't even considered until recently. The following diagram displays the capital stock dedicated to the recruitment of study abroad students. This rate is growing especially amongst companies with a capital of 1,300,000 USD or more. 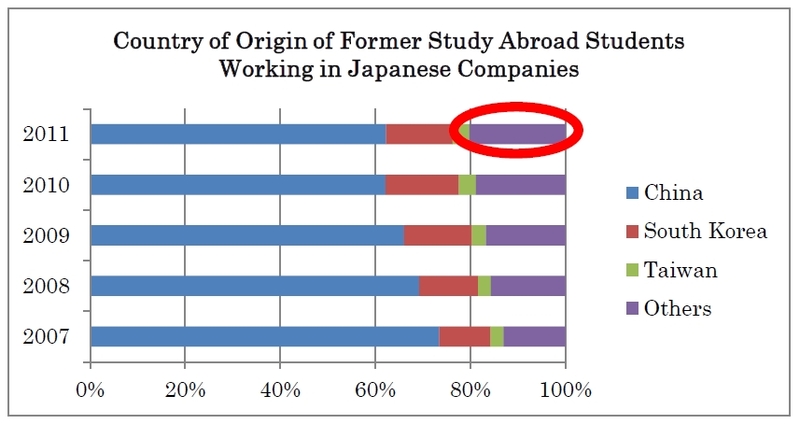 This proves how much efforts the Japanese industry, with large companies at its core, is putting into hiring study abroad students. International students should consider this a chance to find a position where they can make use of their full capacities. In addition, amongst the 582 companies affiliated to the Japan Business Federation, i.e. 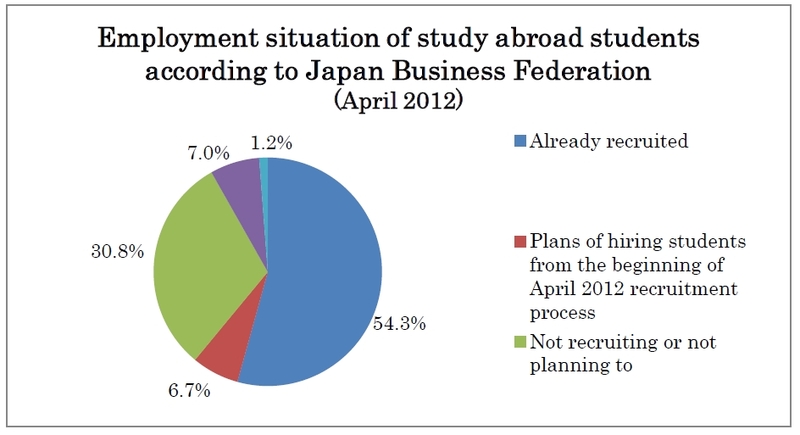 most of Japan's large corporations (over 70% of which have more than 1,000 employees), 54.3% have “already recruited study abroad students” and a further 6.7% “intend on hiring study abroad students during their April 2013 recruiting process”. 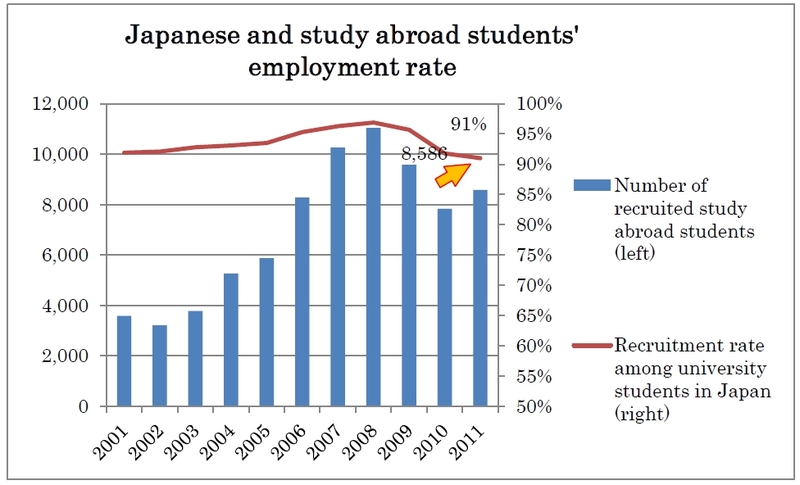 Most Japanese university students start job-hunting approximately a year before graduating. Some find a position extremely fast while others struggle for months. This job-hunting system, called “shūshoku katsudō” (就職活動), is unique to Japan, although it has gone through many rather surprising and radical changes in recent years. 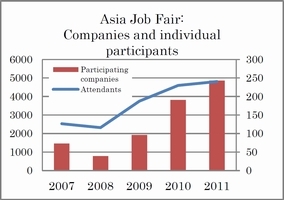 Indeed, there has been a surge in the number of job-hunting seminars reserved to overseas students. 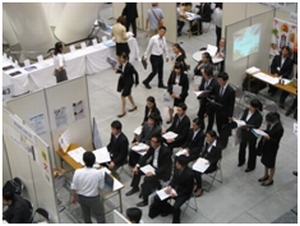 You can see suited-up study abroad students attending many an event where Japanese companies present their activity. 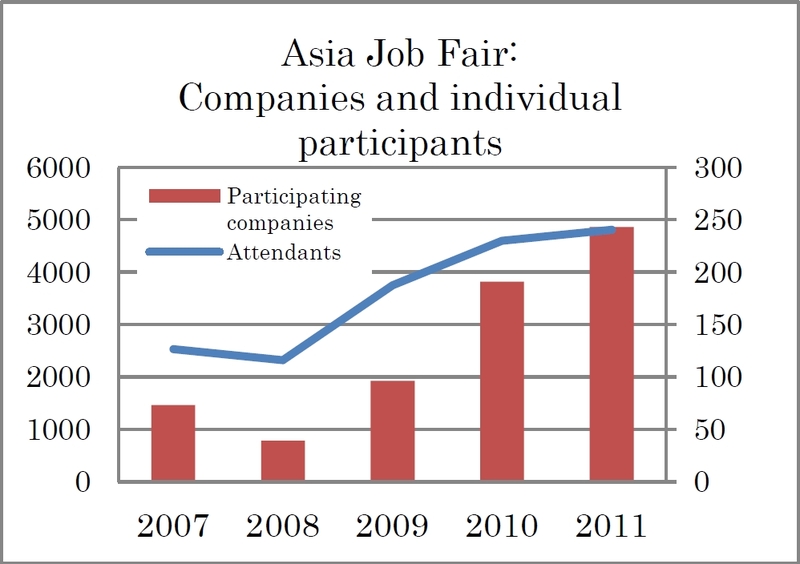 For instance, the Asia Job Fair is held twice a year in Tokyo and many presentations are exclusively carried out for non-Japanese attendants. Participation is soaring on both the company and student sides: altogether, a total of 243 corporations have attended the 2011 events (summer and winter). The types of activities non-Japanese are entrusted with have changed for the best in the last few years. Until recently, international students were only expected to be proficient in languages other than Japanese. But according to data collected in 2011, the number of translator/interpreter positions are declining while trade, sales and education-related activities are going up. 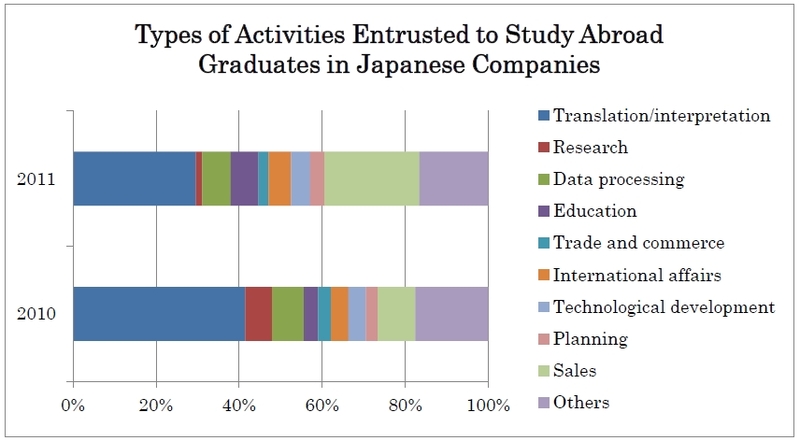 This means that Japanese companies' needs and expectations towards foreign workers have changed and “communication skills” and “academic achievements” are valued over mere language abilities. We can also observe that, lately, companies have come to hire international students without asking about their Japanese level. Isn't that proof that you are now expected to show your worth as a true business on the Japanese and world markets? Now seems to be the best time to give life in Japan a try. So why not seize the day and come experience Japan's highly regarded education system…?